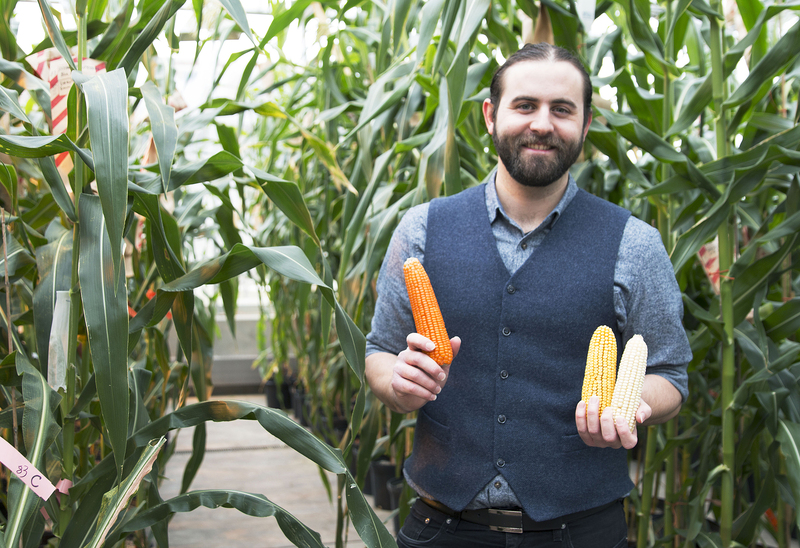 WEST LAFAYETTE, IN (February 6, 2019) – “Orange corn,” a more nutritious, naturally selected variety of corn is now available in the U.S. markets through Purdue-affiliated startup NutraMaize LLC. The bright orange corn, derived from varieties that originated in South America and the Caribbean, is not the variety eaten off the cob. It is milled to make products such as cornmeal, grits and polenta. “People have described the corn products as having a rich, kind of nutty, buttery flavors,” Evan Rocheford said. Because corn is used in a wide variety of popular food formats in the U.S., including tortillas, chips, and cereals, improving the carotenoid content of corn provides an opportunity to increase significantly the amount of the beneficial antioxidants Americans consume without changing consumers' eating habits, Torbert Rocheford said. The orange corn is licensed through the Purdue Office of Technology Commercialization and the startup also received assistance in developing a business plan and seeking grants from the Purdue Foundry, an entrepreneurship and commercialization accelerator in Discovery Park's Burton D. Morgan Center for Entrepreneurship, as well as assistance from the State of Indiana SBIR/STTR Program. The Purdue Office of Technology Commercialization operates one of the most comprehensive technology transfer programs among leading research universities in the U.S. Services provided by this office support the economic development initiatives of Purdue University and benefit the university's academic activities. The office is managed by the Purdue Research Foundation, which received the 2016 Innovation and Economic Prosperity Universities Award for Innovation from the Association of Public and Land-grant Universities. For more information about funding and investment opportunities in startups based on a Purdue innovation, contact the Purdue Foundry at foundry@prf.org. For more information on licensing a Purdue innovation, contact the Office of Technology Commercialization at innovation@prf.org. The Purdue Foundry is an entrepreneurship and commercialization accelerator in Discovery Park's Burton D. Morgan Center for Entrepreneurship whose professionals help Purdue innovators create startups. Managed by the Purdue Research Foundation, the Purdue Foundry was co-named a top recipient at the 2016 Innovation and Economic Prosperity Universities Designation and Awards Program by the Association of Public and Land-grant Universities for its work in entrepreneurship. For more information about funding and investment opportunities in startups based on a Purdue innovation, contact the Purdue Foundry at foundry@prf.org. HarvestPlus is developing and promoting new, more nutritious varieties of staple food crops with higher amounts of vitamin A, iron or zinc — three of the micronutrients identified by the World Health Organization as most lacking in diets globally. The process is known as biofortification — and regular consumption of these innovative crops is improving nutrition and public health.